Mohamed Zaree, the director of the Egypt office of the Cairo Institute for Human Rights Studies, met with French President Emmanuel Macron today Tuesday, January 29, 2019 at the French ambassador’s residence in Cairo. During the meeting, Zaree emphasized that human rights should not simply be a subject in bilateral discussions, it should be the foundation of Egyptian-French relations, taking precedence over profits from arms deals. The Egyptian government then uses weaponry to violate rights on a continual basis, eradicate any free or independent outlets for dialogue, and bury any opposition. Rather than promoting stability as the Egyptian government commonly claims, this repression primarily serves to fuel cycles of violence and vengeance. 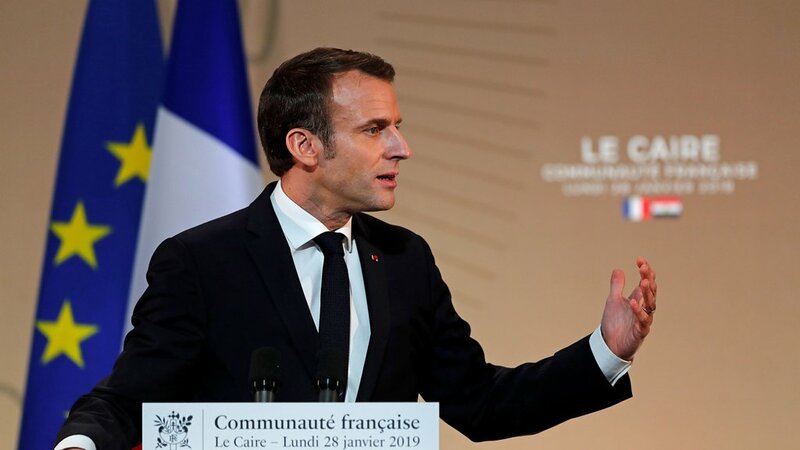 Zaree urged the French president to uphold France’s leadership on human rights issues by rejecting its current complicity in the repression and killing of the Egyptian people. This rejection must not only be voiced in official talks, but also practiced in official action: France must ensure that French weapons and communication technologies are not being used in Egypt against rights activists and peaceful political dissidents. This can be achieved through an independent investigation team that examines the most significant reports from human rights organizations and draws on the expertise of representatives from Egypt’s civil society and legal communities. The results of the investigation should be announced to the Egyptian and French people alike. Zaree noted that the Egyptian state, instead of combating terrorism, is instead busy attacking human rights defenders and peaceful political opposition figures including secularists and Islamists. It is relentlessly pursuing people with non-mainstream sexual orientations and even footballers, throwing them all in prison on fabricated charges. This unhinged repressive flurry is made possible by surveillance technologies and programs Egypt has purchased from democratic states like France. In the meeting Zaree also stressed that it was vital for the international community to refuse to sanction any attempt to amend the Egyptian constitution to eliminate presidential term limits, on any pretext. He said that the international community should consider the unrest arising from the absence of mechanisms for the peaceful rotation of power in Egypt and look at the consequences of Mubarak regime’s refusal to relinquish power by peaceful means common in democracies.